While mouthwash can help rinse away food debris and bacteria after brushing, it is not an essential part of a good oral hygiene routine. However, it doesn’t do any harm either, and can help fight bad breath. Many people enjoy rinsing with mouthwash after they’ve brushed, because they feel that the mouthwash is clearing away all that loose debris left over after brushing. While this is actually true, rinsing with water after brushing has the same effect. More than anything else, mouthwash is a good addition is to a proper oral hygiene routine, not a substitute. It will never take the place of brushing, flossing, and visiting the dentist, but it can help freshen your breath, and it’s mostly harmless. This may surprise you, if you’ve heard about the studies over the years that connect mouthwash use to things like cancer and heart disease. For instance, one fairly recent study in the journal Free Radical Biology and Medicine found that some mouthwashes could raise blood pressure by wiping out a type of mouth bacteria that helps the body generate nitric oxide. Nitric oxide is known to play a critical role in protecting the cardiovascular system, including keeping blood pressure down. However, this study focuses on mouthwashes that contain a strong antibacterial agent called chlorhexidine, which is typically only available by prescription. In addition, it was a very small study of just 19 participants, and therefore requires more research to support its findings. Since the 90s, studies have suggested mouthwashes that contain alcohol may contribute to the development of oral cancers. But many experts say that these studies are flawed, and focus on excessive mouthwash use—three or more rinses a day. In addition, several review studies have failed to find links between alcohol rinses and cancer. However, it is important to note that mouthwashes with alcohol in them can dry out your mouth, so if you have issues with dry mouth, choose an alcohol-free version. 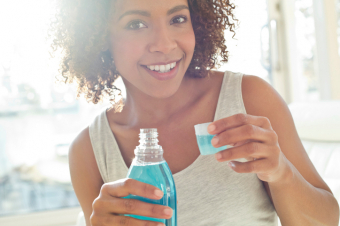 Antiseptic or antibacterial mouth rinses present a more complicated issue. Only people who have periodontal disease or other harmful types of oral bacteria should use these types of rinses. If you want to use one, be sure to consult with your dentist first. Those with healthy teeth and mouths who want to use mouthwash should select a mild one without alcohol or strong antibacterial agents. Ultimately, mouthwash may feel nice and refreshing to use, but it really doesn’t do much other than (possibly) help reduce bad breath. If you like mouthwash, there’s no medical reason not to rinse with it once or twice a day, but if you want to save some money, just rinse with water instead. Have more questions about caring for your oral health? Contact our Surrey dentists today to book an appointment.